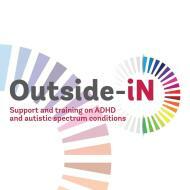 Outside-iN is a community interest company dedicated to supporting and educating families, adults and professionals living with or working with Attention Deficit Hyperactivity Disorder (ADHD), Autistic Spectrum Conditions (ASC) and associated conditions. ADHD and ASC are complex, often hidden, spectrum conditions. Our specialist team of professionals are unique in that they all also have first-hand knowledge through living with, or being closely related to, someone with ADHD and/or ASC.